Walter Roy Mills joined the ‘Chesh’ in November 1938. He was 17 years old at the time, and was one of the youngest members ever to join the club up to that time. He raced with tremendous enthusiasm during 1939 and 1940 and showed great promise of developing into a fine rider on reaching a more mature age. He kept the Club’s name on many start sheets in Open events in the critical year of 1940 when most of our racing men had been called up for active service. Towards the end of summer 1940 Roy volunteered for service in the RAF and went to South Africa training to become a pilot. He returned with his ‘Wings’ and the rank of Sergeant-Pilot and served for a considerable time with the Coastal Command. He went to India with the South-East Asia Command. He was killed during a highly secret air operation over Burma in March 1945. He is buried with his aircrew in a European Cemetry in India. The plate was given to the Club by his parents. 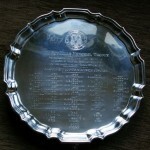 It is presented to the member who attends the most club runs in the season. The first ever holder of the trophy was Frank Illesley in 1946. The most prolific winners of this trophy have been Roy Rosborough, the sadly missed Brian Downing with 8 wins each and, more recently, Phil Fern, the current holder, who has won the trophy 14 times.